Can Seamers | Guide to Common Can standards for Can Seaming with specifications. Industry Standards for 3 piece and 2 piece Sanitary Cans recommended for proper can seaming. 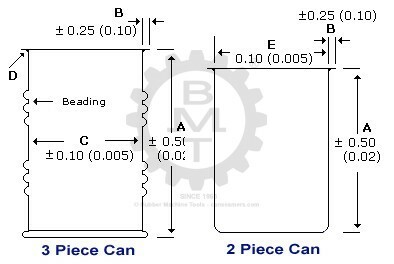 The seam quality produced by the Can Seamer is greatly dependant on the quality of the Cans & Ends used.